Over 34 million Americans have office or sales jobs, forcing them to remain sedentary for eight or more hours a day. According to a report published in Annals of Internal Medicine, the average person spends more than half of their waking hours in an inactive state. This is either sitting in front of a computer, watching TV, commuting to and from work, or sitting at a coffee shop. Sitting for prolonged periods of time can cause many problems such as chronic back pain, poor posture, even potentially deadly diseases such as diabetes, heart disease, or obesity. According to the study, people who watched the most TV over the span of 8.5 years had a 61% greater risk of dying a premature death than those who watched less than one hour. If you spend a lot of time sitting down for your job, take a look at the specifics of how this can negatively impact your health, according to 4 experts in the industry. Slouching forward at work to stare at a computer screen puts tremendous strain on the neck, particularly the cervical vertebrae, which connects the spine to your head. Poor posture also damages the back and shoulder muscles, as they become overextended. Less blood flow and oxygen in the brain. When we move our bodies we bring more blood and oxygen flowing throughout the brain, which helps us maintain clarity and keeps our minds sharp. However, sitting for too long slows the flow of oxygen and blood to our brains, inhibiting our ability to think clearly. 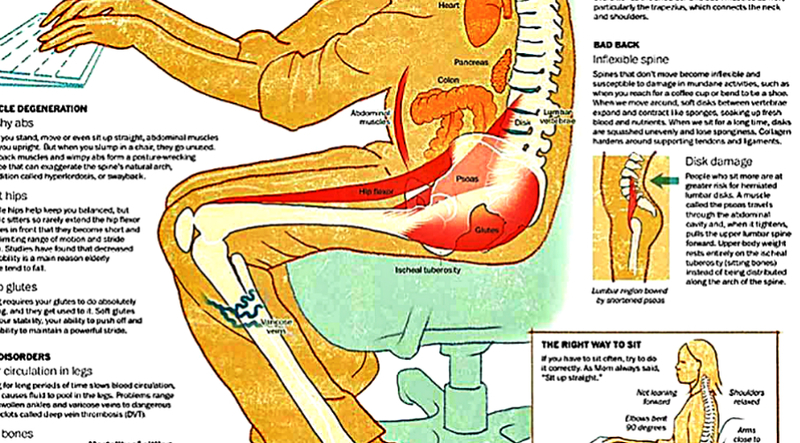 Sitting for too long contributes greatly to back pain, inflexible spines, and disk damage. By sitting for too long, the disks become uneven and compact, even causing collagen to build up around tendons and ligaments. Herniated lumbar disks occur more frequently. Sitting doesn’t require the use of your ab muscles, and if they go unused for too long, this can cause unnatural overextension of the spine’s natural arch. By sitting too long, the hip flexor muscles become short and tense. The glute muscles also become soft. Remaining seated for long periods of time can cause heart disease, cardiovascular disease, and colon cancer. In short, these problems are caused by the overproduction of insulin due to inactivity, and sluggish blood flow to the organs, as well as weight gain. Sitting too long hinders circulation in the legs. This causes blood to pool around the ankles, which then results in swollen ankles, varicose veins, and even harmful blood clots. Another more subtle issue caused by prolonged sitting is that bones become weaker and less dense. The 3 ways you can combat sitting for too long are taking short breaks, exercising daily and doing yoga couple of times per week.